Padmashree D.Y. Patil College of Engineering in Akurdi is one of the most reputed engineering colleges in Pune. Known for its brand and being the coolest campus in the PCMC area, this one will help you enjoy your 4 years of engineering to the core. When you enter the DY Akurdi premises, just at the entrance there’s a fountain. You turn left, there’s a fountain. You turn right, there’s a fountain. You go straight, there’s a fountain. With all that greenery and all, you’l feel as if you have entered Mysore Park! The number of students attending the lectures in classrooms is less than the fountains in campus. 2. Huh? Attendance? What's that? That’s the best thing of being in DYPCOE! Here you don’t have the extra burden of maintaining the attendance above 70-75%. Come whenever you wish and go whenever you wish to go. You are the master of your own attendance. No strings attached! And to top it all, in DYPCOE, anybody can answer anybody’s attendance call! Last year, two students (names cannot be divulged) from PCCOE attended Theory of Computation lecture (as if the lectures in PCCOE were not enough) in DYPCOE and guess what? they even answered the roll-call attendance! The playground of the college is across the road. Hence if you plan to free your muscles, you need to take the leap of death and survive the on coming vehicles from both the directions. BE WARNED! This stretch of road has witnessed quite a few accidents. Speaking of all the Engineering faculty in this college, the faculty from the comp department in specific have had many tales of “not complying” with students during submissions or practicals. You better be aware of these teachers if you have picked this department. Keep a smiling face and be nice for a change 🙂 Besides these types, there are 10 more types of teachers you would encounter in your college days. 5. We have a college uniform?? What?? Where?? This may come as a surprise to even some students in DY reading this now! DY has an official whitish creamish uniform which you may never get to see in all your four years. Except during university practicals or students applying for placement. Not that you would want to see it anyways. 6. Don't lose your parking token! At the entrance (which is open for everyone most of the time (including dogs)) you will receive a parking token, which you must preserve like its the most precious thing you will ever hold on to. That is besides your internals. If you do happen to lose it while spending your time inside gazing at waterfalls and fountains, be prepared for some tough time from the guardians (watchmen) of DY Patil. Engineering is never quite complete without a sutta session with your newly acquired college friends. For such people we have just the place for you. You will find a shack to the west of the college gate, WILSON TAPRI – which is ever crowded with students who have similar tastes such as you. Good news you don’t need to cross any road for this one. You will find a cafe right in the campus here, which serves you general stuff like coffee which no one likes. The name of the cafe is pretty appropriate as no one has a clue of what the time is here. (including the teachers). If you bunk and you need some time to kill..this wouldn’t be a bad place. The annual college fests held here are pretty big. Students put in a lot of dedication. These fests brings pure enjoyment and some really fun memories in all your engineering life. Just like the Gryffindor & Slytherin would never stop that cold war kinda thing among themselves, DY and PCCOE (being geographically close) would always run that race of superiority on any topic. Let that be placements, academics, attendance, campus, uniform…. just anything can ignite a war of words. And to add it all, just like India-Pakistan, there is a border between PCCOE and DYPCOE- two railway lines! The institute already bear a brand name of DY Patil franchise. So, the temptation of completing engineering in such happening place and that too under Savitri Bai Phule Pune University (name changed) affiliation attract many OMS (Other than Maharashtra) candidates. Specially the Northerners! You might see many snow white Kashmir di kalis, and handsome Delhi de dudes in and around the campus. 12. There is so much to do... Except Academics! Rotract Club, Phoenix Cell, and another dozen of different committees and cells you can become a part of. Umm.. Academics? Whats that? Let’s plan an event and start working for sponsorships. Last but not the least, who would forget the amazing flash mobs in the campus? By hitting one of the share buttons below, you’ll not only be the first one to share something about your college that was never been written in this way, but also you’ll motivate our team by letting more and more people know about us and we would come up with some crazy regional stuff like this!! Do you know 13 Things about your College? Tell us 13 things about your campus by sending it to “911@campustimespune.com” and become a featured author on Campus Times Pune. More Crazy Stuff on Facebook! Campus Times Pune is an initiative taken by some enthusiastic students of Pune to entertain the "Netizens" by providing cool and trending content online. Articles from contributors who prefer keeping their identity anonymous, are published under our authorship. 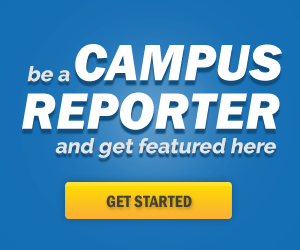 You can contact us with your articles by sending them to "911@campustimespune.com"
Dr. D.Y. 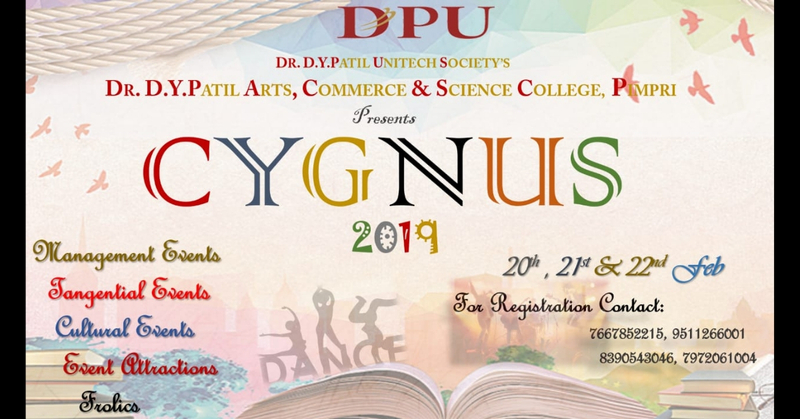 Patil College, Pimpri is launches the first edition of Cygnus 2019 which includes various events like War of DJs, Model hunt, The Bike Show and others!